When I write a story about the interesting events of life, I try to arrange the circumstances in chronological order so they make sense to the reader. Unfortunately, discovering these facts is often a long and non-linear process of random conversations. Sometimes things make sense and sometimes they don’t. For example, I learned that Uncle Bob wasn’t actually hit on the head by a tree when he had his “mishap.” He was jostled by a branch as the tree shifted and it knocked him down and into another tree. He hit his head and the rest is history. It was complicated and as with everything that happens at home when I’m not there, I have to masquerade as a private detective to get all the details properly situated; that makes me a real Nancy Drew. Interesting; he’s got a few chickens and he’s mentioned the possibility of other small livestock, but he’s never said anything about a pig. Now he’s got three. 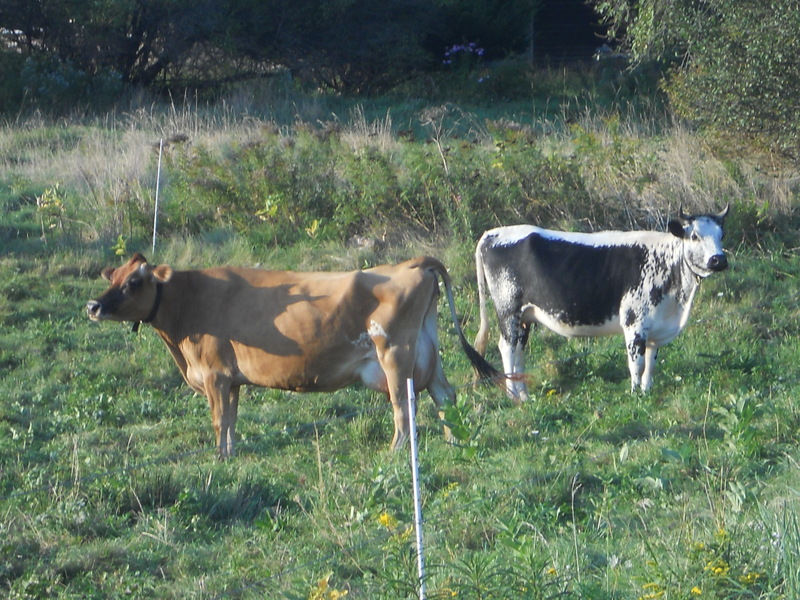 While working in the home garden with Uncle Bob the following Saturday, he briefly mentioned that a few cows from Topsham had gotten loose and strolled through The Farm on their way to town. Maybe they needed a Moxie. I asked him for details and since Uncle Bob prefers to say less than more, he outlined a brief scenario wherein a few cows ambled through the field at the The Farm, made their way to a certain spot, were rounded up, and went peaceably home. “Were they running?” I asked. Uncle Bob gave me one of those looks that made me embarrassed for asking. I can almost hear the mortification in his voice when he explained how left to their own devices, cows will certainly pick up their handbags and head to town as quickly as their skinny little legs will take them. He turned his back to me and resumed his garden chores, likely shrugging that his own flesh and blood could ask such silly questions. At lunch, I asked my father if he knew about the traveling cows. He provides more vague replies and acknowledgements, but no concrete details. If there were no trees involved, he’s not interested. No one seemed at all surprised. I have found that the best investigative style for solving cases like these is to know nothing about the information being presented. It worked for Columbo and sometimes it works for me. “Really? A stampede? Uncle Bob didn’t say anything about it” I responded. As it turned out, 15 cows and an ox from land adjacent to The Farm got loose. They wandered over to The Farm and while no one really knows what scared them, they started running down the road. They crossed the Little River bridge and started running up the hill and over my farmer friend’s garden. They stomped around for a while, making a mess. Another neighbor, skilled in the way of wayward animals, finally rounded them up. The owner showed up, took a look at the mess in the garden, and offered up three little pigs as a peace-offering. A lot of interesting and exciting things sure do happen when I’m not at home. Maybe I need to open a detective agency in Lisbon Falls? This entry was posted in Farmers and tagged Columbo, cow stampede, Nancy Drew, pigs, solving life's mysteries. Bookmark the permalink. Betcha those cows were moo-vin’ right along. Down in Florida, the land behind the house is owned by Farmer Ben. He seems decent enough, but his 300 lb wife on the mobility scooter once almost got off her mobility scooter in her efforts to get me arrested. But that’s a different story. Normally he had horses in the pen right behind me, but for a while he had a black heifer, don’t ask what variety. Friendly enough calf. We had a number of hurricanes come through, no damage except to knock over my already rotted fence. It took a while to get the new fence up, and on Thanksgiving Day the calf decided to pay a visit to my back yard and see what was tasty. He didn’t do much damage before I got hold of him, but you know my farm experience (none). I could not get that damn thing to budge, and he probably wasn’t 250/300 lbs yet. Grab, push, yank, shove, yell–nothing worked, although I could hold on to him enough to stop him from going to eat something else. Fortunately, I could see Ben across the fields, probably 400 yards away, and I let loose with the loudest holler of my life. Just once. And even stranger, he heard it. I felt better when he couldn’t move that cow, either. He finally lured it away with a bucket of oats. The calf spent the rest of its probably short life in a much smaller pen on the other side of Ben’s property (I wasn’t offended, but I suspect Ben was mortified his livestock was on someone else’s property). Cheers. That is really interesting; I have never been to Florida and just assumed there were only retirees and Friends of Mickey Mouse living or visiting there. I was over to The Farm today and didn’t see any wayward animals, retirees, or mice. It was heaven. If you see a 300 lb woman on a mobility scooter, get out of there.